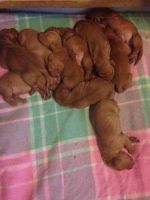 Hungarian Vizsla breeders links and breed information on pups4sale.com.au. pups4sale testimonial: We now have deposits for nine pups...I have back orders for females.Many thanks for your excellent web site - well over 900 hits so far. The Hungarian Vizsla is a one-of-a-kind dog that just about anyone would love to have. Originating in Hungary, this is a breed that is as athletic as they come and very loyal to their owners. While Vizslas have long been known for their hunting and pointing abilities, they are one of only a few hunting breeds that are as happy being around family members as they are being sporting animals. The Hungarian Vizsla is medium-sized dog that is easily recognized because there aren't many variations to the breed's looks. Similar in stature to the Weimaraner, the Vizsla has lean, muscular physique, which helps them to be good runners and hunters. 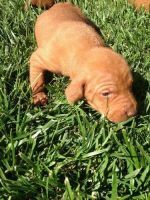 Male Vizslas generally grow to be about two feet tall and can weigh anywhere from 45 to 65 pounds when they reach adulthood. Females are usually an inch or two shorter and max out at around 55 pounds. Unlike just about every other dog breed out there, Hungarian Vizslas normally only come in one color, which can be described as golden rust or a mix of copper and gold. The coat is short, thick and smooth. Hungarian Vizslas have an interesting mix of behavior characteristics. They have a ton of energy, yet they are normally gentle around people. They are about as loyal as dogs come and show it in the way that they lay in their owners' laps or against their feet. The love that Vizslas have for their owners is shown by the way they will cry when they don't feel that they are getting enough attention. 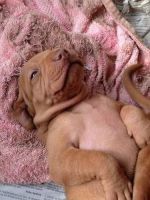 Hungarian Vizsla puppies are intelligent at a very young age, which is both a good and a bad thing for owners. It's good because they can pick up on some simple training commands quite quickly. It can be bad when these smart pups become stubborn or when they find a way to be sneaky. They do have that unfortunate instinct to chew, so owners need to teach them not to do this very early on. For the most part, Vizslas are great with children and fully understand that they are not dealing with adults when they are around them. Still, potential owners should keep in mind that this breed is very energetic and can sometimes accidentally run into very young children. As with any pet, owners should keep an eye on their Vizslas when they are around kids. As long as Vizslas are socialized with dogs and other animals at a young age, they normally grow to good social animals. However, they are pack dogs, so they need to be trained to understand that they are not the pack leader and should therefore respect the people and animals that they meet. When trained correctly, Vizslas can be excellent guard dogs. Their loyalties to their families and their “pack” instincts will usually make them bark if they feel that their pack may be in danger. This is a fearless breed that is not afraid to deal with any type of danger if they think it will save their families. Vizslas can become frustrated and depressed quite quickly, so they are not a breed that can be left alone for long periods of time. Pretty much any breed that thrives on bonding with its owners is going to have a tough time being alone, so potential owners should always keep this is mind when picking a breed. Some dogs can live happy lives even if they aren't fully trained. This is not one of those breeds. 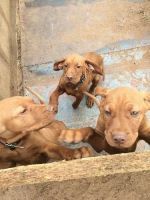 They have to be taught early on simple commands, but the training has to continue into adulthood if owners want to have a satisfied Vizsla. Vizslas are extremely intelligent dogs, but this does not mean that learning commands is going to be simple. They need to be taught that they are not the pack leader or else they will try to take over training sessions and will become difficult to teach. Once a Vizsla knows that it is not in charge, it will do anything it can to please its owners and will be less challenging to train. It takes a little bit of time to first get through to a Vizsla, but they can pick up on commands very quickly if owners don't bore them. Vizslas have heavy exercise requirements, so owners have to make time to give them close to two hours of running around time every day. This may seem like a lot, but this is a breed that is only calm around the house when it has a regular exercise schedule. The three things that Hungarian Vizslas are known are hunting, retrieving and swimming. They are all-around athletes, so it's important that owners understand this and are able to meet these needs. They thrive in open spaces, so this is a breed that will not be happy in city environments. The fact that Vizslas are smart dogs means that they need to be challenged by their owners on a regular basis. This means that they need to be taken to different environments in order to satisfy their need to see and smell new things. Most owners will love this about this breed because it means they can take them anywhere and they know that they will have a happy pup. This is why the Vizsla is known for being the perfect pet for the adventurous type of person or family. While Vizslas do require specific training and exercise needs, they don't require much when it comes to grooming them. In fact, they are self-groomers like cats, so they smell better than other dogs and they only need to be bathed five or six times a year. Their natural short hair means that Vizslas don't need to get their hair cut at all, but owners should keep a comb or a brush around in case anything gets stuck in their hair. They don't sweat into their hair, which is just another reason why they are considered extremely clean animals. Like with every other breed, it's important that owners check their dog's ears and nails on a regular basis to make sure that they don't end up with tick bites or other issues. This is a healthy breed, but they also love to run around in woods, so they need to be checked for anything that might have come home with them. While Hungarian Vizlas are prone to hip dysplasia just like most other active dogs, it's actually not as common as it is with those other breeds. Of course, if they have been running all of their lives as a lot of Vizslas do, the chances of them ending up with hip issues goes up a bit. The average lifespan of a Hungarian Vizsla is around nine years. However, healthy Vizlas normally live to be anywhere from 12 to 15-years-old. This is a very healthy breed when trained and treated correctly, so that's just another reason why so many people have taken an interest in Hungarian Vizlas over the years. While this is obviously a fantastic breed of dog, it's also a dog that has specific needs. 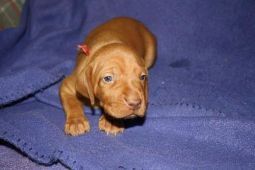 Potential owners need to know if they have the time and the patience to own a Hungarian Vizsla before they commit to owning one. The most important thing that a potential owner needs to have is a lot of energy so their dog can get the exercise that it needs for its entire life. A happy Vizsla is one that has an owner that can keep up with it when it wants to run around, so someone who has that type of energy would be a great fit. Vizslas don't have to live in a house full of people, but they do love being in a pack, so a family of three or four would usually be the best fit. They do tend to get more attached to the person who trains them, but they will be loyal and loving to the entire family. 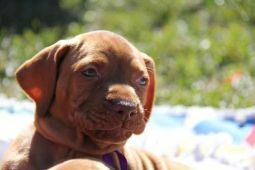 The Vizsla isn't the best breed for a first-time dog owner because of its training needs. It's not absolutely necessary that owners have experience with this breed, but it is important that they know exactly how to train an animal with a pack mentality. The more intelligent breeds are always going to be tougher on people who don't have experience training dogs. People who are away from home a lot or plan on boarding their pets regularly are not a good fit for this breed. It's vital that they have owners who have the time to spend with them throughout their lives so they can be both mentally and physically healthy. All in all, the Hungarian Vizsla is an amazing animal that is both physically and mentally gifted. Yes, they have more needs than a lot of other breeds, but these are the challenges that many owners love to deal with because they know that their dog will end up being a special pet.